You are currently browsing articles tagged Rodelle. Vanilla reviewed: Rodelle Pure Vanilla Extract. Cost: Rodelle provided this sample for review. When a representative of Rodelle Vanilla contacted the site, I was excited about the opportunity to compare professionally-made extract to homemade. 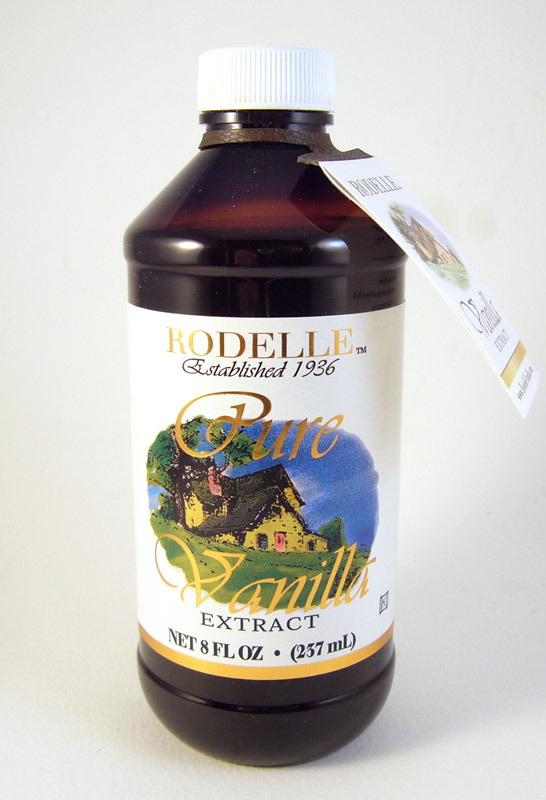 Rodelle sent an 8 oz bottle of their standard-quality pure vanilla extract (they also make a gourmet-quality). The first thing that I looked for was the origin of the beans used, but this isn’t listed on the bottle. Rodelle’s website says that they use a custom blend of beans “from the top growing regions throughout the world”, but not a lot of additional detail is provided. The vanilla comes from several different growing regions, and might even be a mix of planifolia and tahetensis beans. Update: according to Rodelle’s comment below, this is 100% Madagascar grown vanilla (planifolia). This is single-fold extract that, unlike homemade extract, provides standardized doses. Rodelle uses a heat percolation extraction method. There is an intense debate in the vanilla world over the use of heat. Opinions are split between those who say that higher temperatures bring out flavors that aren’t possible with cold extraction methods, and those who claim that heat destroys the more delicate flavors or brings out undesirable ones. It was a surprise to see sugar listed on the ingredients in a upscale-marketed vanilla like Rodelle. Rodelle mentions the sugar several times on their site as an example of the organic ingredients used in the extract. Sugar reduces the alcohol nose, and is an FDA-permitted additive for vanilla extract, but many gourmet manufacturers now choose to leave it out. The extract is reddish-brown in color and has a light viscosity. The aroma is dark and rich, and more like a whole vanilla bean than many commercial extracts. My best guess, based on the aroma, would be that this is a mixture of Madagascar- and PNG-sourced beans. The sugar indeed cuts the sharp alcohol smell, but there is still a sense of it in the mouth when exhaling after smelling the aroma. Three different tests help get a sense of the different qualities of this vanilla extract. In a sugar icing test, it has good richness and depth, with strong tobacco overtones and the flavor of real beans. Mixing it into warmed milk brings out custard overtones, and also enhances the rich flavors of the milk. In a practical use scenario — the oatmeal cookie test — the vanilla extract comes across as very sweet, with a light flavor. This is an extract that I would use for everyday cooking, but I prefer something a little more robust to for use as a feature flavor in something like ice cream or crème brûlée.